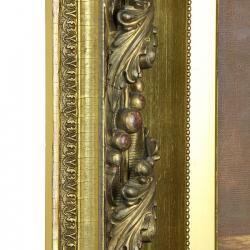 This oil painting is attributed to Tyler, however, it is unsigned, which is not unusual for this painter. 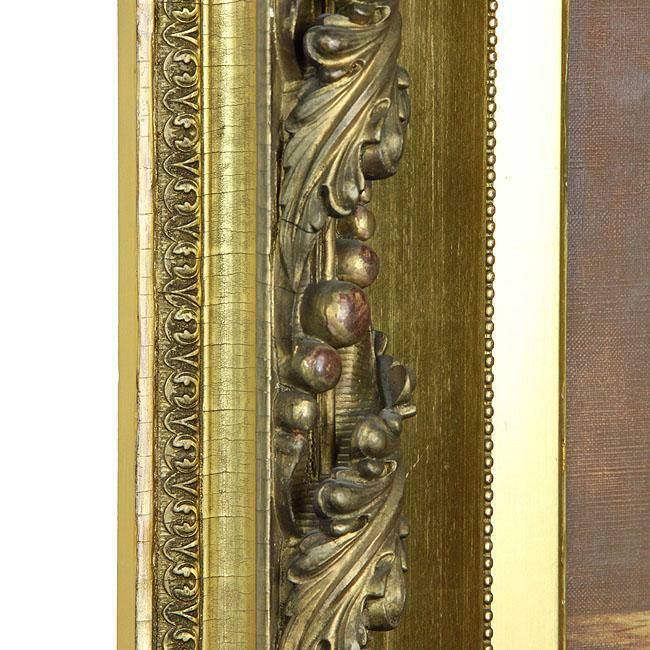 The strength and technique of this picture clearly indicates the work of this painter, whose work is highly desirable. 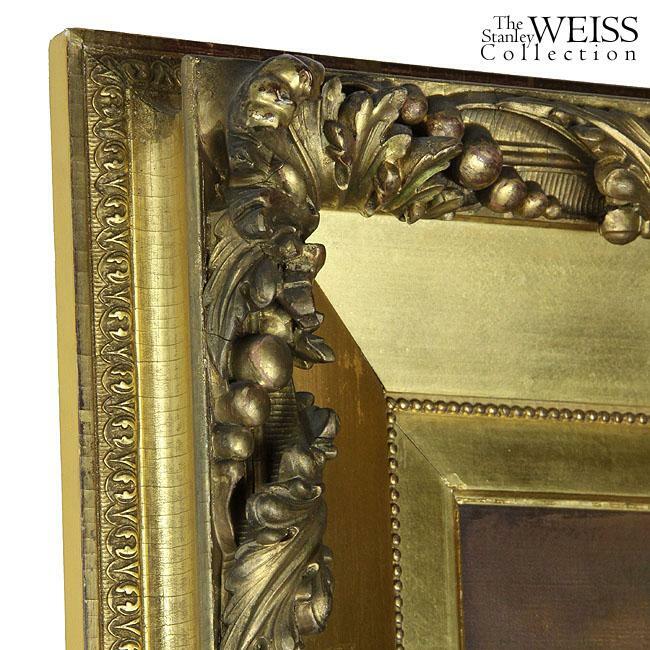 The frame is original and-with its carved spiraling presentation of acanthus leafage and beading all covered in a soft gold patina-is absolutely fabulous. The condition is excellent, and it is unlined. 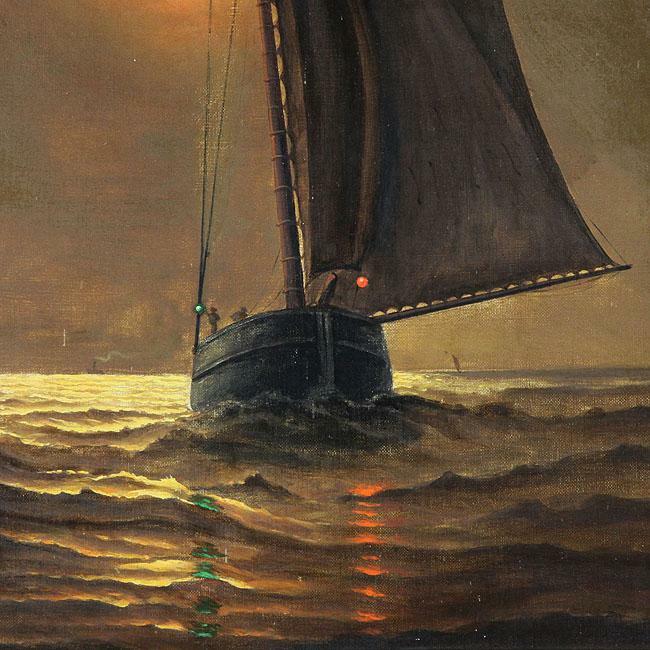 James G. Tyler was one of the most notable maritime painters and illustrators of his day. His popularity can be gauged by the fact that his works were often forged. It is estimated that in New York City in 1918, more than 100 works falsely carried the artist's name. Tyler was born in 1855 in Oswego, New York. At age 15, Tyler, already fascinated by the sea and its vessels, moved to New York, where he studied under marine artist A. Cary Smith. This brief tutelage was the only formal art training Tyler ever received. No aspect of maritime life escaped Tyler's attention. 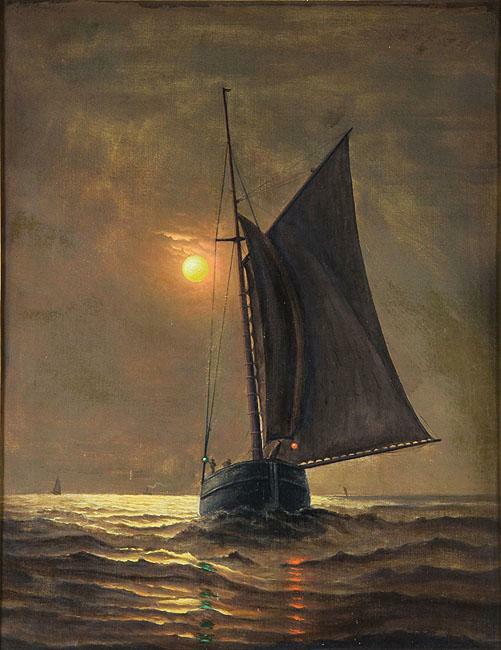 In addition to painting all types of boats—from old sloops to clipper ships—he painted a variety of seamen, coastal scenes and seascapes. From 1900 to 1930, Tyler traveled each year to Newport, Rhode Island, where he painted the annual America's Cup Race. Some of these paintings were commissioned; the remainder were widely exhibited and critically acclaimed. In fact, Tyler received a number of important commissions in his lifetime. He also capitalized on the money to be made through magazines, and was a regular contributing writer and illustrator for some of the major publications of the time, including Harper's, Century and Literary Digest. Tyler's artistic style is vivid and poetic, infused with his unique and specific enthusiasm. 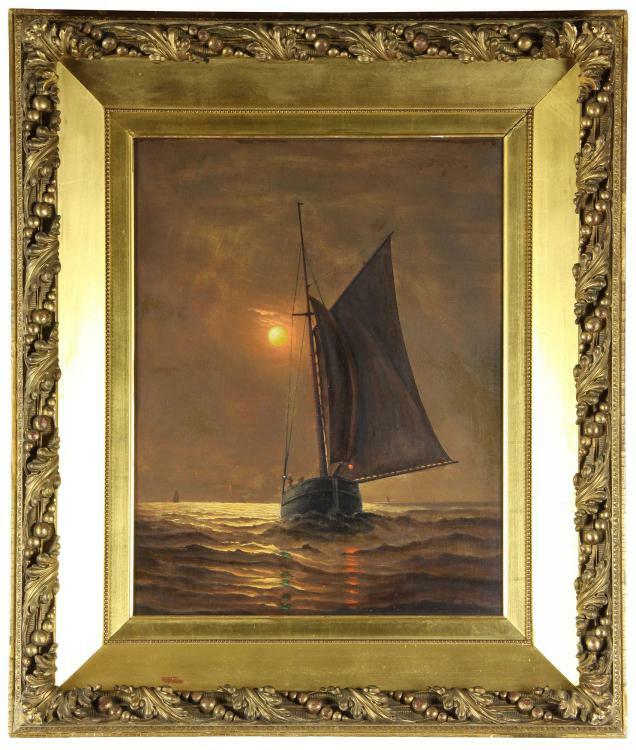 As seen in his Freshening Breeze (date unknown, Kennedy Galleries), his emphasis is more on mood and impression than on the exacting details conveyed by more realistic painters. His works have been critically compared with those of Albert Ryder. When, at the height of his career, Tyler became aware of the number of paintings falsely circulated under his name in New York, he complained to the district attorney and was able to successfully pursue several civil action suits. Having lived for most of his life in Greenwich, Connecticut, Tyler moved to Pelham, New York in 1931, before he died. 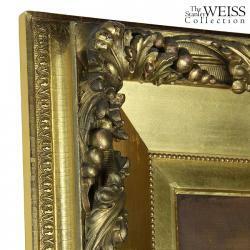 Frame: 39" x 28 1/2"